Rich fruit, spice and spirit pastry, Candlemas gift but delicious on any day! Plus gluten-free version. 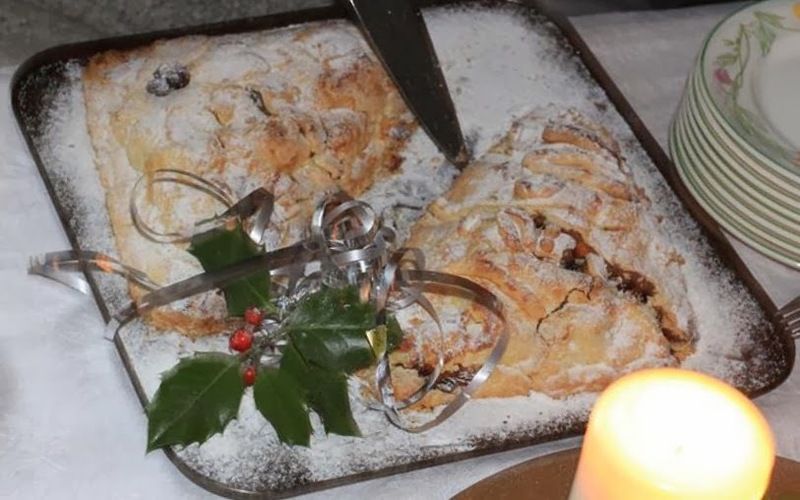 Pudding by candlelight, a traditional gift of a rich dried fruit, spice, butter, apple and wine/spirit pastry, which was given at Candlemas but is so good eaten any time of the year. These quintessential mincemeat tarts, the probable forerunners of the mince-pies of today, were rich fruit and spice-laden pastries traditionally given by god parents to their god children on New Year's Day and at Easter. As with the plum pudding, the ingredients in the mincemeat included beef and were essentially a way of preserving meat over the Winter months. With changing tastes and the ability to keep livestock all year round, overtime these became sweet rather than savoury pies. 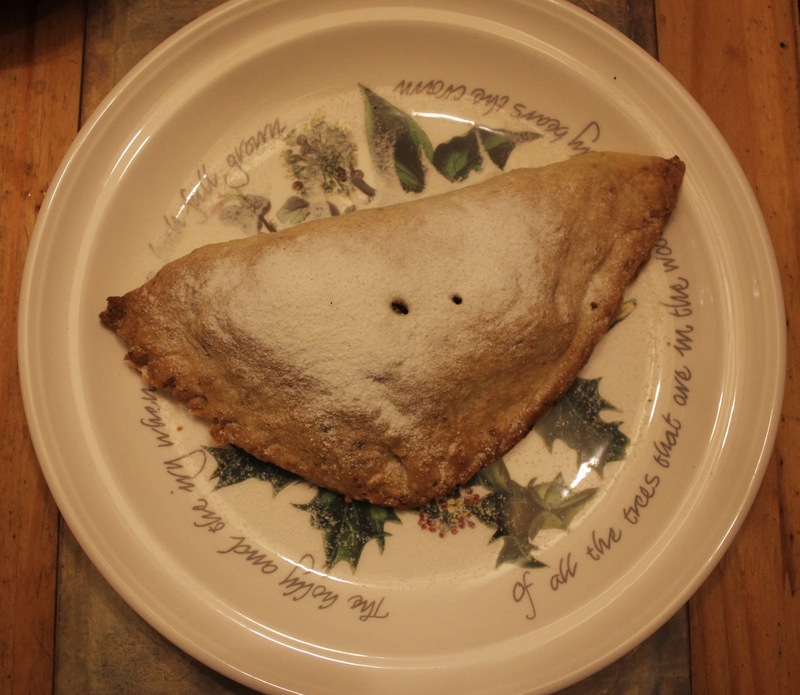 As with many of these early delicacies the individual recipes were handed down verbally but these pies also have regional associations, with the God-cakes coming from Coventry in the West Midlands and the Kitchels from Suffolk. Above is the gluten-free version of the Coventry God-cake, I took to a family dinner on Boxing Day. I just used a ready made gluten-free flour. The trick with the gluten-free flour is not to skimp on the butter and if you are using it, organic virgin coconut oil. I always use half the quantity of fat to flour and this is particularly important with gluten-free flour, otherwise you can end up with a very hard pastry. Some recipes suggest puff pastry for God-cakes but personally I much prefer short crust as a complement to the fruit. 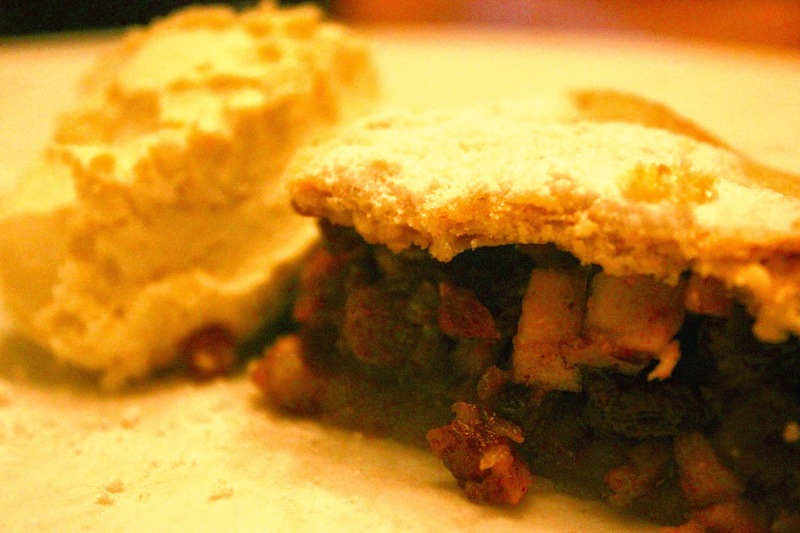 You can also make these pies from leftover mincemeat but I like to make them from whatever dried organic fruit and nuts I have available. However, in keeping with the old mincemeat recipes I add a touch of Christmas cheer in the form of a dash of brandy or similar spirit. To make one large God-cake, as pictured above, you will need two handfuls of filling. My mix comprises; dried:- figs, dates, apricots, prunes cranberries, raisins, sultanas, plus almonds and hazelnuts. To this I add a raw chopped apple, half a teaspoon of mixed spice*, a dessert spoon of rapadura (raw cane sugar), the grated peel of a lemon and a dash of brandy. I leave the mix to stand and incorporate all the flavours whilst making the short crust pastry. *('mixed spice' is a traditional British pie, pudding, biscuit and cake blend, made from, ground coriander, cassia, ginger, nutmeg, caraway and cloves). For the one large God-cake, which is enough for four servings, I use 170g (6oz) of flour, 2 dessert spoons of powdered almonds to 120g (4¼oz) of raw butter and 50g (1¾oz) of coconut oil. I then rub all these ingredients together to make a mix which resembles breadcrumbs. At this stage, I then add a dessertspoon of rapadura and enough water to make a stiff paste. I roll the paste out onto a board into a square. The God-cake was traditionally a triangular cake, which was meant to represent the Trinity. It is this religious symbolism, along with the crib shaped mince-pies, which was supposed to have been instrumental in getting these pies banned from sale during the period of the Commonwealth in seventeenth century England. The filling then has a dessertspoon of coconut oil or raw butter added to it before it is spooned over half the square so it can be folded over to form the triangular pie. I usually make a few cuts into the pastry, to let any possible steam, from the raw apple out of the pie and stop the pastry from going soggy. I cook my pie in a wood cooker at approximately 200°C or 400°F for about 15 minutes or depending on your oven, until the pastry is starting to turn a golden colour. I then sprinkle with a layer of 'icing' sugar, which I just make by grinding up raw organic sugar in a blender. This pie goes very well with raw cream or cider syllabub. So enjoy this last day of Christmas and remember today we are half way across the Winter and heading towards the Spring.